Of all the various pole rigs that anglers use, the paste rig is perhaps the most misunderstood but it’s one of the easiest to tie, easiest to fish and it catches absolutely tons of carp each year. The most important thing that you need to get right when paste fishing on the pole is to plumb the depth accurately. So, you’ll need to lower your plummet all over your swim to locate a flat area where you can be 100 percent sure that your bait will always be touching the bottom. The float is important too. The perfect paste float will be seriously long, have a large balsa body and a very long and thick sight tip. All these features are vital to ensure that your float performs in the way it should. Shotting paste rigs is easy – you just need a bulk of shot set just above your hooklength. It ought to be positioned around 8ins from the hook. One thing you must bear in mind is that you need to add enough shot to take the float down to the top of the balsa body – all the sight tip should be visible above the water. The next important thing to do it tie on the largest hook you have, bearing in mind the rules of the venue. You can use huge hooks when paste fishing because the paste is moulded around the hook, therefore the fish can’t see it. 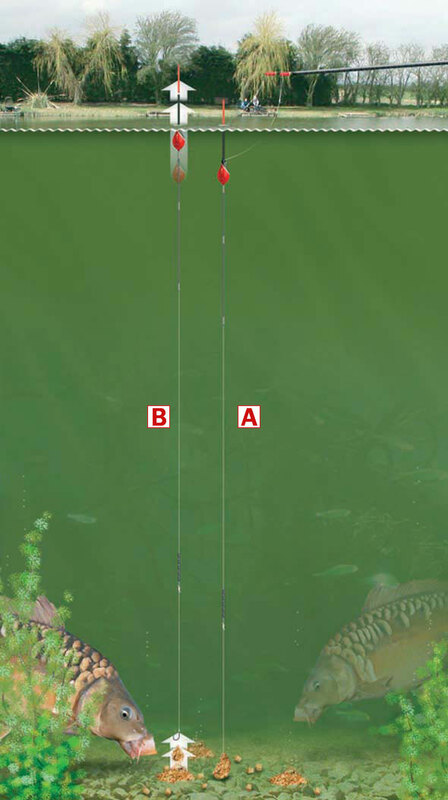 When you have found the area that you are going to fish, it’s time to set the correct depth of your rig. Clip a plummet onto the hook, lower it into your swim and if the whole of the float’s sight tip is showing you have the rig set too deep. You will need to slide the float down the line a little until only 1cm of the float is showing when you lower the plummet and rig into your swim. This is crucial. Take a look at the paste rig on the right (A). Here the plummet has been removed, a large chunk of paste has been moulded around the hook and the float sits perfectly in the water – this is because the weighty paste is anchoring the rig to the bottom – it’s pulling the float down. Now take a look at the rig on the left (B). Here the paste has dissolved and broken down, therefore it has lost its grip on the hook. The buoyant pole rig will pull free from the paste and you’ll immediately see the float pop up to the surface. That’s the time to ship the rig back and bait the hook with some more paste. No other rig tells you that your bait has fallen off quite like this paste rig – it’s perfect and helps you save time waiting for a bite when your bait has dissolved ages ago! Bites are unmissable – the float will either shoot under, rise to the surface then go under, or just bob around and go under.